Abdominal aesthetics, in other words, six pack aesthetics is an effective treatment that add the muscle image of the abdomen and create a distinctive contour. Who can have Abdomen aesthetics? How is abdominal aesthetics applied? 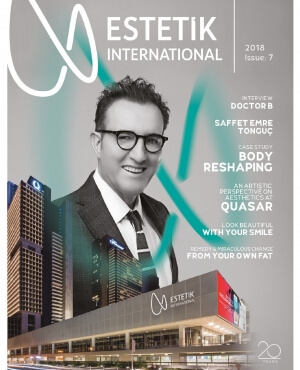 Abdominal aesthetics are performed by using the liposculpture method in Estetik International clinics. Liposculpture is a form of body shaping and is also called as painless liposuction. Liposculpture, an FDA-approved and reliable system, accurately and precisely shapes fat. It works by micro inputs and thin vibration cannules. Movement disrupts fat cells and converts them into fat emulsions. When doing all this, it does not damage blood vessels and nerves or does not tear muscles. Because it has high vibration and absorption function, it has an optimum impact and it is beneficial for the skin not to remain smooth and to have no bruising. Due to the structure of the cannulas, it helps to remove the fat tissue in sensitive areas even in hard-to-reach areas. In abdominal aesthetics which can be performed under general or local anesthesia, the muscles are firstly located and marked. Liposculpture technique is applied to the curve points of the muscles and the fat in this area are thinned. This process, which is made with micro inputs, allows the muscles to be thinned and the existing muscle structure becomes clear. If there is too much fat in the abdominal region, the fat is obtained from the entire abdomen and then the form is given. The process lasts for an average of 1 hour and the incision is not carried out, as it is applied with micro-entrances, the healing process is extremely comfortable. Many men and women try to be successful by performing intense sports and diet exercises to provide this clear vision on their abdominals. Compulsive abdominal exercises are the primary rule for increasing the thickness of the muscles and they must be done regularly. But, despite all this process, it is sometimes impossible or time-consuming to get the aesthetic image that individuals want because the muscles remain below the fat layer. The abdominal aesthetics means interfering with these fats in the abdominal area, giving the muscles an image of the muscles and also making the underlying muscles distinctive. What is the abdominal aesthetic? Abdominal aesthetic is an application that provides a muscular image to the abdominal region applied with a liposuction technique. Who can have Abdominal aesthetics? Your plastic surgeon will decide whether you are an ideal candidate for this type of liposculpture or whether you should first have a different body shaping procedure. Those who already have an athletic body and have a definite muscle structure benefit most from their abdominal aesthetics. Is there anything I should do after the application? Once the procedure is complete, it will be helpful to follow a proper diet and exercise program to maintain this appearance. Typically it takes exactly one hour, but the total duration depends on the amount of muscle tissue required. Your physician will remove the fat deposits resistant to exercise in the navel or in the natural wrinkles of your abdomen with small incisions of one or two millimeters . A small amount of fat is extracted to emphasize individual muscle building and a perfect appearance is achieved. Candidates for abdominal aesthetics should have good muscular structure and already developed abdominal muscles. The abdominal aesthetics is applied to emphasize the muscles you already have and the small fat depositions that hide them. We recommend for patients with an average of less than two centimeters less fat. Your plastic surgeon will measure this fat to make sure you are a suitable candidate. Both men and women use this body shaping procedure to describe the abdominal segments and achieve a more muscular and more vivid appearance. Before taking local or general anesthesia, your plastic surgeon will mark your abdomen as guiding your surgical incisions. Using a device called cannula, it takes your excess fat and shapes your abdomen. The cannula used herein is more flexible than that used in conventional liposuction procedures. We recommend that you wear a corset after surgery. Most likely you will be home the same day a few hours after the procedure. What happens after the abdominal aesthetics? It may be swollen and sometimes painful, but with proper care and medication, they will not last long. You will have to wear your corset for a few weeks, but you can shower in 48 hours. Avoid lifting heavy weights and creating any pressure in the abdominal area. Your doctor will provide you information about this. It may take up to several months for final results to appear. What are the benefits of abdominal aesthetics? If you have spent the time and effort to have the body in your dreams and your optimal results are still not achieved, abdominal aesthetics can be a perfect solution.